Bolivia is home to some of the best sites in South America. On this Uyuni to San Pedro de Atacama tour, you will appreciate its unspoiled natural beauty and rich culture. Bolivia is an ideal destination for those who want a unique adventure experience. The most prized possession here is their world-renowned Salt Flats, also known as Salar de Uyuni. Discover the beauty of the Salt Flats during this 3-day Uyuni to San Pedro de Atacama tour. Designed for travellers who desire a unique, luxurious, and unforgettable adventure. On this Private Uyuni to San Pedro de Atacama tour, enjoy breathtaking panoramic views of the largest salt flat in the world. Salar de Uyuni is known for its heavenly landscape. In the dry season, the striking white desert ground and the deep blue sky creates a unique, dreamlike contrast. The rainy season creates a wet surface where the salt flats transform into a giant mirror, reflecting the beautiful landscape. In addition, stand in awe under a sky full of stars during your most noteworthy night tour of Uyuni. As the Salt Flats are at a high altitude and there is no light pollution, experience spectacular stargazing. Marvel at the iconic Stone Tree in the Siloli Desert. Behold the red-hued and deep emerald lake at Eduardo Avaroa Reserve. Witness some of the rarest types of vibrant flamingos as they elegantly pilot their desert oasis. Enjoy the magical Salt Flats whilst traveling and sleeping in maximum comfort during your Uyuni to San Pedro de Atacama tour! 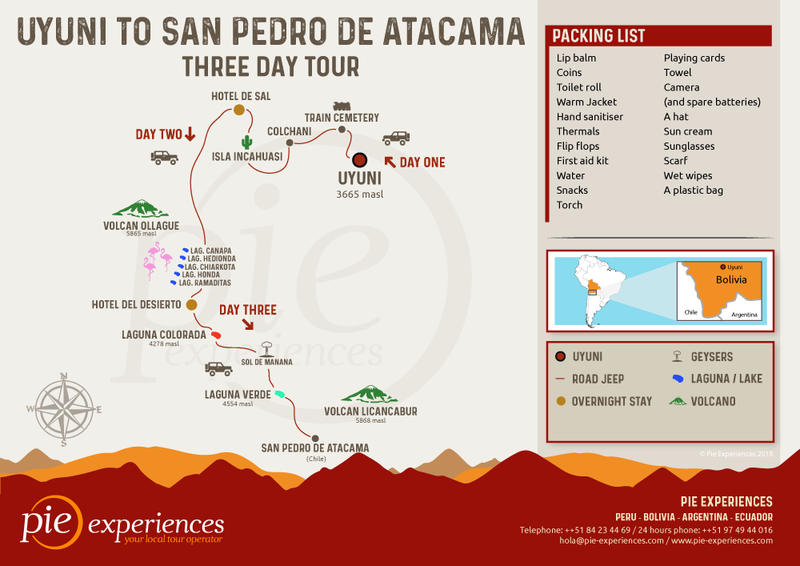 Click through to “Tour Plan” to see the full itinerary for the Uyuni to San Pedro de Atacama Tour. Day 1 | Uyuni, Salt Flats and Epic Star-gazing! Your Uyuni to San Pedro de Atacama tour starts as soon as you are picked up by your private vehicle and then taken towards the infamous Uyuni Salt Flats! Firstly, the tour kicks off at the abandoned Train Graveyard. In fact, this is indeed a site where the skeletons of steam trains are scattered about the calm desert landscape. Then, we will observe the equally important salt processing in the local Colchani Village before traveling on to the Salt Flats. The most noteworthy highlight of the day is experiencing the magical Salar de Uyuni (Salt Flats). Enjoy its uninterrupted geometric tiles, crisp salt pyramids, vibrant flamingos and giant cacti. The night ends with a cocktail whilst you absorb an epic sunset followed by spectacular stargazing. Your nightly accommodation is at the charming Tambo Coquesa Eco-Lodge. At this Lodge, you will enjoy lovely views of the Salt Flats and Ollague Volcano right from your window. Depart from the Lodge and head into the core of Salar de Uyuni. Visit the striking Incahuasi Island; an island loaded with giant cacti that has panoramic views of the salt flats. Marvel at Lake Cañapa, an untouched salt lake brimming with colorful flamingos. Next, you will go to Los Flamencos Eco-hotel, your home for the night; perfectly positioned on Lake Hedionda. Here, discover three rare types of flamingos gracefully navigating the lake right outside your door! Following an early morning breakfast, we first start by exploring the stunning Siloli Desert and the vibrant Eduardo Avaroa Reserve. Today’s highlights consist of the wonderfully coloured “Laguna Colorada”, as well as the beautiful Dali desert. Finally, we move on to visit the steaming hot springs and also the boiling geysers. This marks the last stop of our tour as we head towards the Chilean border. Your Uyuni to San Pedro de Atacama tour ends this evening in the lovely San Pedro de Atacama! Entrance to National Park Avaroa US$30.00 or 210 Bolivianos. Important: Due to the rainy season (from January to April), it is not possible to access Incahuasi Island. However, there is the possibility of visiting the island, if it does not rain on the day of your tour. Note: This Tour is provided in English. Your tour begins with a morning pick up from Uyuni. The first stop on your Uyuni adventure is the abandoned Train Cemetery. A skeleton graveyard for antique locomotive trains, set against a tranquil desert oasis. You will carry on to Colchani, a traditional Bolivian village, where you can observe the complex processing of salt from the Salt Flats. Here you will have the opportunity to purchase handmade salt crafts. The highlight of the day is experiencing Salar de Uyuni, the world’s largest salt flat! Here you will enjoy iconic characteristics of the “white desert” such as striking salt pyramids and small rivers flowing through the salt flat surface called “eyes of the salt''. Salar de Uyuni is a photographers dream. The deep blue sky and the crisp white surface makes for magical and clever photographs that will remind you of this heavenly landscape for years to come. Furthermore, you will visit the famous and informative Salt Museum. After enjoying a scenic lunch taking in the stunning views of the salt flats, you will have the opportunity to explore one of the unique islands filled with giant cacti before heading to the Lodge. Check into your nightly accommodation at the charming and rustic “Tambo Coquesa Eco-lodge” to recharge. You will later return to the salt flats just in time to enjoy a desert sunset complemented by a Bolivian welcome cocktail. After sunset cocktails, you will return the hotel for a delicious dinner and relaxation. Last, but not least, after sundown, you will be picked up to begin your unforgettable Salt Flats Night Tour. Your evening will consist of dazzling stargazing under the calm desert sky. After a nice breakfast, you depart from the Hotel to re-enter the Salt Flats. Enjoying more lovely views of the striking desert landscape. A stop at the iconic Incahuasi Island, an island filled with large cacti, will make for beautiful 360-degree views of Salar de Uyuni. Next, you will visit archaeological ruins, followed by a stop at the impressive and active Ollague volcano before sitting down for a delicious lunch. Your next stop is Lake Cañapa, a saline lake that is home to colorful flamingos. After that, you will arrive to your accommodation at Los Flamencos Eco-hotel. Your nightly accommodation is conveniently located on the beautiful Lake Hedionda. Take a relaxing walk along the shore of the lake where you will witness three varieties of stunning and graceful flamingos in their natural habitat. A hearty, yet healthy and delicious Bolivian dinner will be served at the Hotel to end your evening. Following a good night's rest, you will spend the morning exploring many natural attractions such as wildlife habitats, pristine lakes (Lake Honda and Lake Charcota), and the iconic Stone Tree in the Siloli desert. Again, you will enjoy a healthy boxed lunch, with an amazing view. The highlight of day 3 is discovering the Eduardo Avaroa Reserve. The Reserve is home to colorful lakes: the fiery red lake, Laguna Colorada, and the deep emerald lake, Laguna Verde. Both speckled with vibrant flamingos. Additionally, you can experience the quintessential Dali Desert, bubbling geysers, and magical hot springs on your journey through the desert. Next, you will head towards the Chilean border, Hito Cajón, where we will switch vehicles for the remainder of your journey. Your adventure will conclude in the evening when you arrive in San Pedro de Atacama and say goodbye to your new friends.